Adrian Lam has urged Wigan fans to turn up the volume – and make the DW Stadium a venue which opposition fans hate. The Warriors open their home campaign tomorrow night when Leeds Rhinos roll into town. A fixture which rarely disappoints has come under sharper focus by the fact Lam will go up against his former team-mate Dave Furner – and both coaches are seeking their first win. And Lam hopes the home advantage which served Wigan so well last season – they lost just once at the DW – will stretch into his reign. Some critics would argue the size of the DW Stadium is not conducive to producing a hostile atmosphere. But Lam has first-hand experience of knowing just how vocal the Wigan fans can be from his own playing days. In April 2004, he ended a seven month lay-off from a knee injury with an appearance off the bench which was met by deafening applause. “I’ll never forget that, the crowd went crazy,” he recalled. “I remember thinking, ‘Wow, is that for me’. I guess it was appreciation but it was an incredible moment for me. “I know they’ll be vocal against Leeds, and we’ll need them to be. We’ve got three in a row right now, it’s a good period to get ourselves right. Lam has named an unchanged 19-man squad – last week, Morgan Escare and Taulima Tautai were the two players to drop out – after Tony Clubb overcame a head knock to play. Kick-off tomorrow night is 7.45pm. 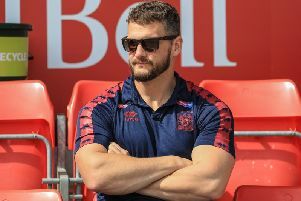 Wigan’s 19-man squad: Joe Bullock, Tony Clubb, Tom Davies, Morgan Escaré, Liam Farrell, Ben Flower, Oliver Gildart, Joe Greenwood, Gabe Hamlin, Zak Hardaker, Willie Isa, Tommy Leuluai, Liam Marshall, Romain Navarrete, Sean O’Loughlin, Sam Powell, Dan Sarginson, Taulima Tautai, George Williams. Leeds’ 19-man squad: Jack Walker, Tom Briscoe, Kallum Watkins, Konrad Hurrell, Ash Handley, Tui Lolohea, Richie Myler, Adam Cuthbertson, Matt Parcell, Brad Singleton, Trent Merrin, Stevie Ward, Brad Dwyer, Liam Sutcliffe, Brett Ferres, Nathaniel Peteru, Mikolaj Oledzki, James Donaldson, Harry Newman.